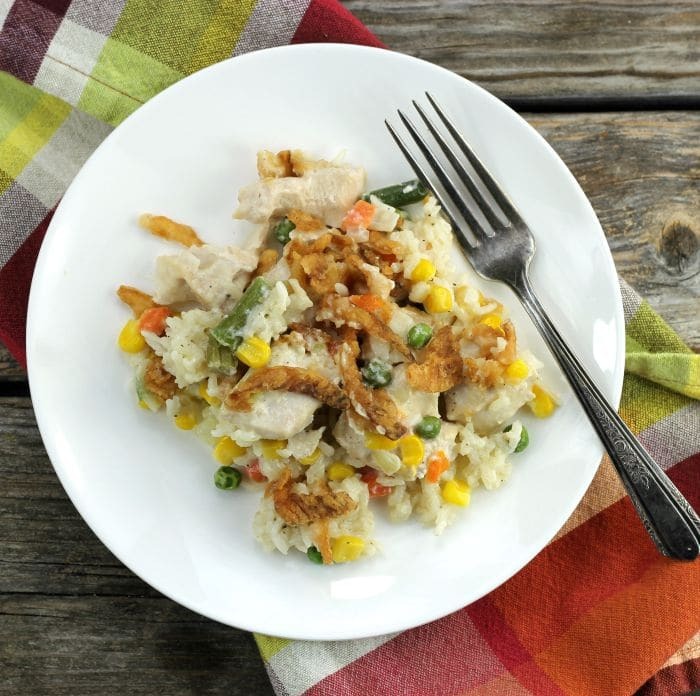 This chicken vegetable rice casserole is the perfect comfort food. Can you believe it is October already? This year is flying by and before we know a new year will be starting. Actually, I have been enjoying the cooler weather. Fall is definitely my favorite season. I love making and eating all the comfort foods. And speaking of comfort foods, I would say that casseroles are at the top of the list for me. Maybe because I grew up eating casseroles and it was something I loved even back when I was a kid. When you live in Minnesota it is a thing that we eat a lot of. I have heard it said that Minnesota is the casserole capital of the country. Do you need to use frozen vegetables in this dish? No, you can add raw vegetables to this dish, but the cooking time may change. I have always made it with frozen. I love the convenience of the frozen vegetables. 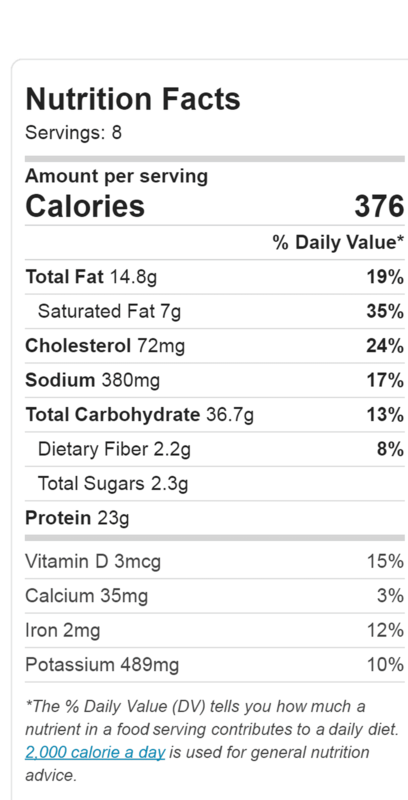 Can you change out the vegetables in this dish? Yes, I have made it with frozen broccoli and cauliflower. Also, I have made it with corn, peas, green beans, and carrots (as shown in the pictures of this post). 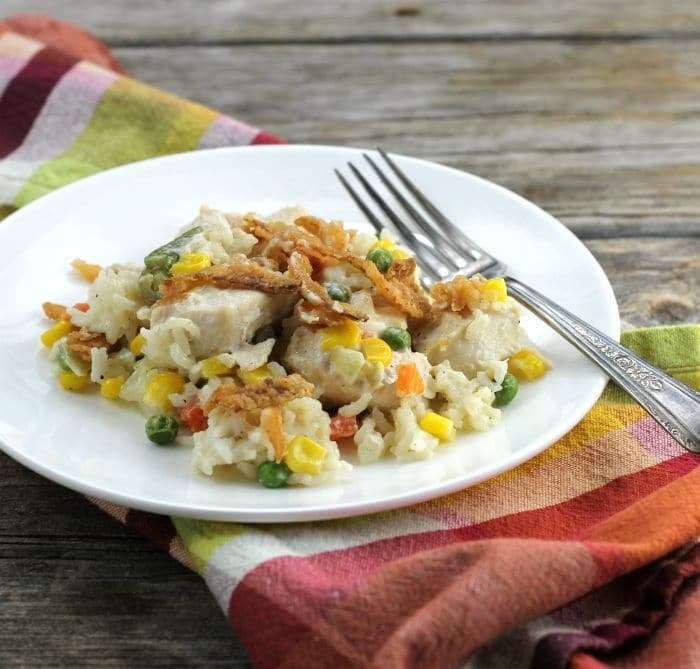 Chicken Vegetable Rice Casserole is an easy baked dish that is tasty and versatile; it sure to please the whole family. Preheat the oven to 350 degrees F. Spray a 9 x 13-inch baking dish with non-stick cooking spray. Add the rice to the bottom of the baking dish. Melt butter in a skillet and add the onion. Cook the onion until tender 2 or 3 minutes. Add the flour and stir in. Add the chicken broth and cream and cook until it starts to thicken. Add the chicken to the rice and top with the frozen vegetables. Pour the sauce over the ingredients in the baking dish. It looks so comforting and tasty…perfect! 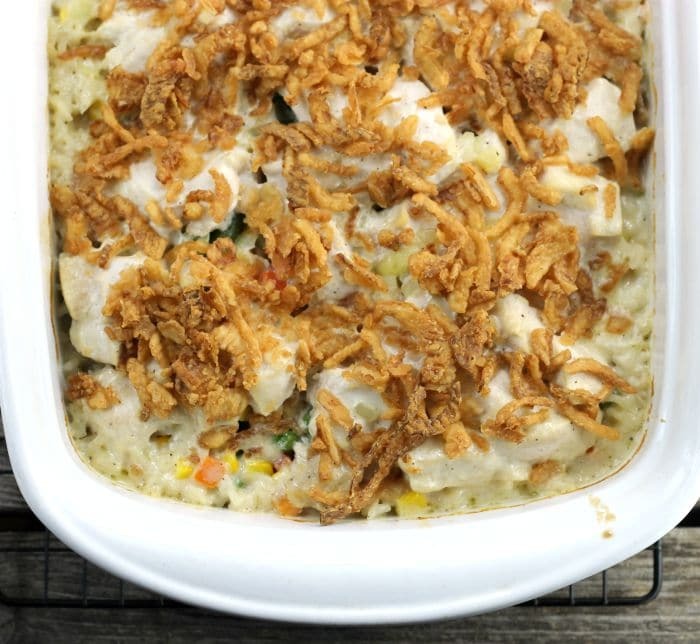 It’s hard to beat a good casserole, and this version sounds awesome, Dawn! It’s cold and rainy here today, and I could totally curl up with a bowl of this casserole for dinner tonight! 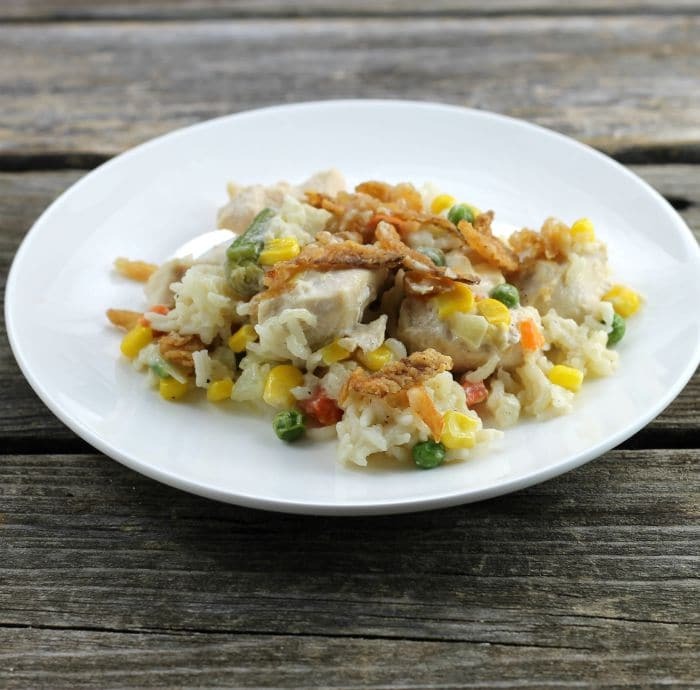 I love rice dish and this with chicken and vegetables looks delicious such a comfort dish Dawn…thanks for sharing the recipe. Have a wonderful week! Casseroles are so good, aren’t they? And although I always think of fall as soup season, casseroles aren’t far behind — a nice, hot comforting casserole is such a pleasure to eat at this time of t he year. This looks terrific — thanks. Dawn this looks really good !